You can earn 80 yards with this purchase! The Titleist 917F2 fairway wood features technology that maximizes distance, forgiveness, and precise customization for every player. The club features Active Recoil Channel 2.0, a design aspect that has been improved to flex more at impact in order to reduce spin and increase ball speed. Additionally, the fairway wood has a variable thickness face insert, which gives off-center shots greater distance. 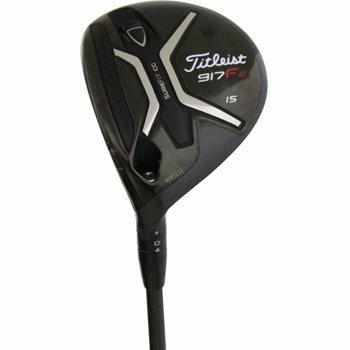 The forgiving 917F2 has a 179cc full pear profile and delivers a slightly higher launch angle and spin rate than the 169cc 917F3 Fairway Wood. ACTIVE RECOIL CHANNEL2.0™ – Improved channel with elastomer insert reduces spin and increases speed by actively flexing at impact. VARIABLE THICKNESS FACE INSERT – Generates more speed around the perimeter of the club face for greater distance on off-center hits. SUREFIT HOSEL – 16 unique loft and lie settings help create a more consistent and optimized ball flight through precision fitting. Review by D. Cruz, 1 year ago. Review by blip42, 1 year ago. Review by Terry, 5 months ago. Review by Z, 1 year ago. Review by Larry P, 2 years ago. Which Surefit CG weight does this come with and does it come with any other weights? Which weight comes with this club - what is the gram weight and is it neutral or draw/fade? Unfortunately, we are unable to verify the weight in a specific club. It is typically the 12 gram draw fade weight but that is no guarantee.